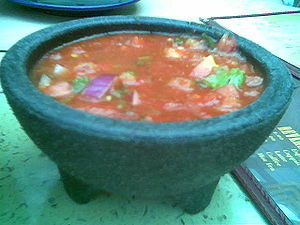 Salsa was originally the Spanish word for “sauce”. Today, the word salsa means a lot more than a spicy dip for your chips. Salsa music took over the world and now salsa brings to mind the image of a gorgeous couple dancing in sensual embrace. I do not mind that you have this beautiful image in your mind when reading “Science Salsa”, but the truth must be said, I meant to call my blog “Science Sauce”. Delicious, spicy, and flavorful, but common, home-made, family recipe salsa. No fancy dancing here, even if we may dance salsa occasionally. Why not “Science Sauce” or “Salsa de Ciencia”? Well, this is a bilingual blog, with a bilingual name, from a bilingual author. My personal recipe has a flavor that is unapologetic Latin-American, rooted in my childhood spent in Colombia and Peru. Sauce cannot describe it properly, it needs to be salsa! I did my PhD studies and postdoc work in the US and the science that I generate and consume is mostly in English. It needs to be science! I gave you some clues about my identity with the tittle of my blog. My information is public and you are more than welcome to visit the “about me” link to learn more about my background, or my page www.IvanFGonzalez.com for more information. Please don’t expect pictures of my (living) family or other private stuff, but you can read Science Salsa with my commitment that you will have a sincere attempt to bring you some flavorful science. Just the way I can personally tell you about it, with no gimmicks or imposter voices. Finally, did you know that the “hot” chemical in peppers affect small proteins called TRPV1 ion channels that normally sense pain? The “science salsa” idea came when I was thinking about my research on TRPV1 channels: Nobody realizes their eyes are covered by nerve endings with TRPV1 channels… until they are cutting hot peppers for salsa and make the mistake of rubbing their eyes. Why we have those pain receptors in our corneas? How did pepper plants develop a chemical that affect our pain receptors (but not bird’s)? Those are some of the questions in science that I think would we fun to discuss with you in the future.